A project of Colors magazine produced with Reporters Sans Frontières. It’s a way to tell stories about the rest of the world without filters, censorship or repression. A means of communication for those without a voice. A way to celebrate freedom of speech and expression as well as the importance of human and physical relationships between people. Colors Notebook was released in April 2006 and sent to people who aren’t usually given a voice: Chinese prisoners, South African children, Canadian priests, astronauts, the mentally disabled, artists but also ordinary people living their lives. Because “the rest of the world” is not a geographic or social concept but a relative one—it depends on where you live. The personalized Notebooks were then returned to Colors to become part of this exhibition. 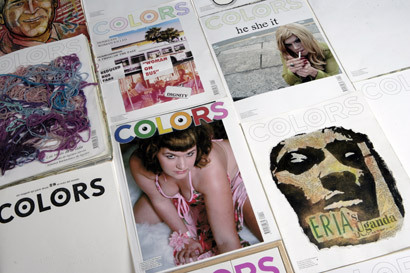 Colors, founded in 1991, is a magazine about the rest of world, published in four languages and sold in over 40 countries. Authors: Colors magazine editorial team, in collaboration with Reporters Sans Frontierès. Colors is grateful to UPM Paper for supporting this project.